“Certainly the state is not our property, but it also does not belong to any leader or party. Our project is clear and aims to rescue the state from collapse and send the guardians of corruption to retirement,” Hariri tweeted, in response to a tweet by Jumblatt. “Tweeting does not make a policy,” he added. “The thing more important than the CEDRE conference is to pinpoint the sources of public money waste and smuggling and to reject any hike in electricity fees,” he added. “For example, you can recover 40% of the wasted funds,” the PSP leader went on to say. 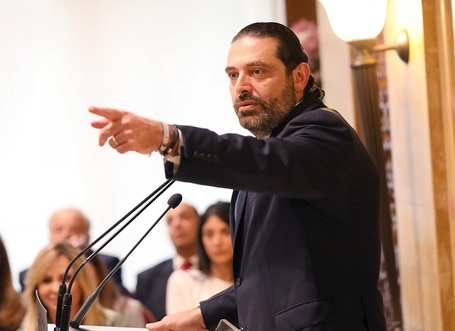 Earlier in the day, Hariri said he was determined to work relentlessly following the monthslong gridlock, assuring that nothing will stop him despite “criticism” against his new government. “Criticisms against the government began and we haven’t even started working yet. I am determined to work and won’t be affected by any attempts to stand in my way,” The PM’s media office quoted him as saying. “The citizen will finally be the top priority, after a nine-month-long formation delay. I will work day and night to compensate for the time wasted during the formation process,” he added. Discouraging any attempts aiming at hampering the government’s work, he said he is eager to ease any difficulties. Both Hariri and Bassil had blasted Jumblatt in recent hours after he accused them of hegemony, unilateralism and disregard for the Taef Accord. Separately, the PSP leader acknowledged that those who carried out the attack against the Al Jadeed TV are supporters of his party . “The perpetrator is present and I will await for the right circumstances to hand him over,” Jumblatt said stressing he is against the attack . On the other hand he vowed to sue al Jadeed blaming the channel’s satirical TV show for the attack. Al Jadeed came under attack early Saturday morning when assailants threw a hand grenade at the station’s headquarters in Beirut, the news outlet reported. At around 3:45 a.m., the assailants sped past Al Jadeed’s offices in Beirut’s Wata al-Moseitbeh in a car and launched a hand grenade toward the building before fleeing the scene. The grenade hit a parked car, and no injuries were reported. Images posted on Al Jadeed’s website showed smashed car windows and damage to one of the building’s external columns.